For several years now, I've been wearing the same make and model of general all-purpose casual shoe - a pair of charcoal and red Merrell Chameleon Wrap Slams. These were my first introduction to Merrells and I liked them so much, I bought an identical pair when the first pair wore out. Quite conveniently, and co-incidentally, the guys at Fitness Footwear seemed to magically some how know that my current pair of Chameleons were close to retirement and offered me the opportunity to review a pair of shoes for them. I had the choice of quite a few pairs of what I call general all-purpose shoes (they call them "approach shoes") or running shoes (trail or normal). 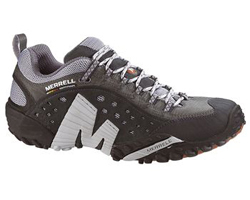 As I no longer run in shoes (barefoot and Vibrams all the way now), I opted for the former and picked a pair of Merrell Intercept approach shoes in charcoal - I may as well stick to a brand I know and like ;-) . Well, my new shoes arrived Monday the week before last and I got to wear them for the first time that Friday and then again this past Friday. Whilst we don't have a dress code at work - other than you must wear clothes and you can't wear football shirts - I like to dress quite smart during the first 4 days of the week and then treat Fridays as a "dress-down" day. This approach helps me switch off from work when I get home. It's also the height of summer in which I wear shorts most of the time I'm not at work so won't be wearing proper shoes either. I'm not too sure what "summer approaches" are or how they differ from "winter approaches", but the Intercepts certainly live up to the rest of this definition in a lot of aspects, but not all. I found the Intercepts to be a little uncomfortable at first, but soon adjusted to my feet and settled down to become quite comfortable by the end of the first day. The second wear was a lot more comfortable from the start. Like any new pair of shoes, given a bit more time, I suspect they'll soften up and settle into their own and become the super comfortable shoes my old ones have become. The shoes seem very snug around the width of the foot. It's not particularly uncomfortable, but it's noticeable if you're used to wearing no shoes, or other wide-fit shoes, or have wide feet. They're not very snug against the heel when using a normal criss-cross lacing technique, though I don't believe this is specific to the Intercepts as I had the same issue with the Chameleons too. With a bit of experimentation with the lacing, I resolved both of these issues by lacing for a wide foot, and then using high lock lacing to try and keep the shoe tighter on the heel. Unfortunately, unlike the Chameleons, there are no eyes, only lace lugs. As such the lock lacing isn't as snug as it could be, but it's sufficient to give a snugger fit. One of the advertised features of these shoes is their sticky soles and boy do they live up to it. They're very sticky, so watch out on polished floors; I can envisage people getting a closer than expected look of the polished floor if they don't lift their feet properly. These bad boys stick and stick well (thankfully without the squeak too). There is one aspect of the above definition that these shoes will not meet: they're not going to be very waterproof given the fabric they're made of and what appear to aeration holes on the sides - don't worry they don't go all the way through. However, thanks to these aeration holes, the shoes are quite cool and coupled with the "antimicrobial" lining, I suspect they won't become smelly for quite some time, if at all. Only time will tell, but if my current Merrells are anything to go by, we won't be smelling these chappies. Slightly off topic, I think it's important to provide a bit more information about my dealings with Fitness Footwear. I can't complain one iota, and I'm not just saying that because they sponsored the shoes. They were friendly, responsive and kept me updated on my order - there was a slight delay as their Merrell delivery came in late. Out of curiosity, I did ask about ordering particular models not displayed on their site, and provided they're from one of the manufacturers they sell and it's a relatively recent model, they'll be able to provide a quote, put in the order for you and give you an approximate idea of delivery time. They're also looking to extend their range of suppliers and shoes as demand grows. All in all, the Merrell Intercepts are a snug, comfortable and supportive pair of shoes which should suit general purpose wear along with some relaxed hikes. They'll become my general "Friday at work" and "I must wear proper shoes with my jeans/combats" shoes (sometimes Vibrams just aren't appropriate) from now on. The service from Fitness Footwear is also very good, and best thing of all: they offer free delivery and they promise to beat any other price by at least £1.